Doncaster Knights will be looking to keep their Championship Cup hopes alive when they take on Coventry at Butts Park Area in their penultimate group game this weekend (3pm). With Knights having dropped to third-place in the four-strong group following back-to-back defeats against Yorkshire Carnegie any result other than a win would probably put paid to their hopes of qualifying for the knock-out stages of the inaugural competition early next year. Coventry have yet to win on the road this season in any competition - though they came close to claiming the spoils in their opening cup game at Castle Park when going down by just one point - and their injury-hit side lost 33-24 at Nottingham last weekend. Former Doncaster players Andy and Junior Bulumakau, who was outstanding in the game at Castle Park, were both doubtful in midweek though both Jack Ram and Latu Makaafi are set to play against their former team-mates. Knights welcome back No 8 Rory Pitman after injury which results in new loan signing Ollie Stedman dropping back to flanker. With Tom James, who has been carrying a foot injury of late, being given a well-deserved rest, Fijian international scrum-half Henry Seniloli starts for the first time since joining the club in August. “It’s a big game for Henry because with Tom being ever-present this season he’s not broken into the side since arriving in August and now he’s got the chance to show that he is good enough to do so,” said Griffiths. With both Nick Civetta and Tom Hicks still out injured, Josh Tyrell drops back into the second-row. Dual-registered Cameron Cowell returns at full-back and it’s all change on the flanks with Dougie Flockhart and Steve McColl coming in for Curtis Wilson and Tyson Lewis. 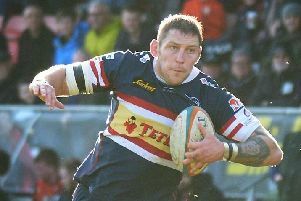 It will be the club’s first visit to the Butts Park Arena, which hasn’t the best of playing surfaces at this level according to Griffiths, for nearly a decade and the Welshman is keen for Knights to not only claim victory on the day but also put down a marker for their league game at the stadium early next month.